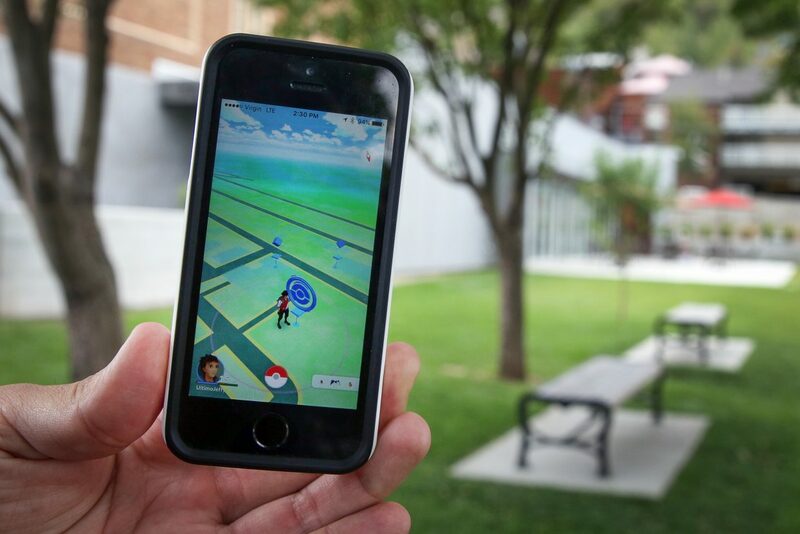 Pokemon Go is seen running on a phone in the foreground, with the Park City Library and its two nearby PokeStops visible in the game. Staff said the game has led many players to print off their favorite Pokemon using the library's 3D printer. Before July 6 of this year, if you saw someone walking down the street or in a park, eyes glued firmly to their phones, that person might have been doing any number of things. After July 6, it became next to certain that person was playing Pokémon Go. Pokémon Go, a free-to-play app for Android and iOS, was released this summer and promptly took the world by storm. It’s an augmented reality game, meaning you use your phone’s camera to look around the real world, with Pokémon creatures visible on the screen as though they really are sitting on that park bench, itching for a fight. The game requires getting out and about in the real world, visiting “PokéStops” and battling for control of gyms stationed at landmarks around town. While the game is harmless by itself, that interaction with real-world locations has led to some issues. Careless players have been injured because they weren’t paying attention to their surroundings, for one. And on Aug. 2, the Provo Library asked the company behind Pokémon Go, Niantic, to remove the four PokéStops on its grounds because hundreds were gathering there day and night. Library officials said the clogged parking lots meant patrons there for events had to park blocks away, and all the players charging their phones — Pokémon Go is a battery hog — meant the facility’s utility bill had gone up considerably. At the Park City Library, there have been no such issues. Katrina Kmak, youth and Spanish services librarian, said there are two PokéStops at the Library, one for the Library itself and one for the Gary Weiss “Don’t Get Me Started” bench at the adjacent field. There is also a Pokémon gym across the street. Kmak said Park City Library hasn’t seen the same issues Provo Library was dealing with after the game was released. In fact, Kmak said the library even briefly considered putting together some kind of event or activity around the game, though they decided against it. She said they worried the game might be a passing craze. She added, however, that parents shouldn’t be too concerned if their children are playing a lot of Pokémon Go. “There are elements in the game that are educational,” she said. “Evolving your Pokémon for a certain cost, selling your Pokémon for certain items, and becoming educated about your surroundings and where you live. As the bell is about to ring on another school year, there might be some concern about the game becoming a disruptive presence on campuses. Bob Edmiston, principal of McPolin Elementary School, said those concerns are likely unfounded. While the library isn’t planning any Pokémon programs, Kmak said they carry plenty of books on the Pokémon universe and she encouraged those who want to know more to stop by. “I encourage enthusiasts to come and see what Pokémon materials we have, print off a character on our 3D printers, or come and use us for our PokéStops. For more information, visit http://www.PokemonGo.com.